Cyphercon is not particularly large, or in a glamorous part of the world — in fact most people who came in from out of town had to fight snow to make it. Yet when I stepped into the con last Thursday there was no doubt something awesome was in progress. People were camped out in small groups, working furiously on their computers, talks were packed with people who came alive in the Q&A, and everywhere you looked you found people deep in conversation with friends old and new. If you missed out on Cyphercon 4.0, you need to make an effort to be here for 5.0. Join me after the break for the highlights of this two-day security conference nestled in the heart of Milwaukee. Last week in Milwaukee was Cyphercon, Wisconsin’s premier hacker conference. You can’t do a hacker con without either an electronic conference badge or a 45 hanging off a lanyard, and the Cyphercon 2017 badge doesn’t disappoint. It’s an electronic cube, lovingly designed by the folks at tymkrs. It’s also a puzzle box with security holes and wireless communications. It’s a mesh network of badges, and one of the best conference badges we’ve ever seen. The most obvious feature of the Cyphercon 2.0 badge is the extra dimension. From the outset, the design of this badge was a 3-dimensional cube, constructed out of beautifully crafted PCBs and soldered together at the edges. The techniques to bring PCBs into the third dimension are really nothing new — we’ve seen 3D PCBs before — but never at this kind of volume. There were over four hundred badges constructed for Cyphercon, and every single joint was hand-soldered. This is something your assembly house just won’t do, and I would hate to think about the poor solder monkeys that would be forced to assemble 3D badges for a larger con. 3D isn’t the only trick up the Cyphercon badge. There are cutouts in each side of the cube exposing LEDs, microprocessors, busses, and a single USB port. This USB port allows the wearer to recharge the battery, yes, but if you install a terminal emulator on your laptop and plug in the badge, you’re dropped into a world of mystery, intrigue, and suffocation. This badge is a text adventure game, with the goal of a game to reassemble a relay-based computer from parts scrounged from around a missile silo. 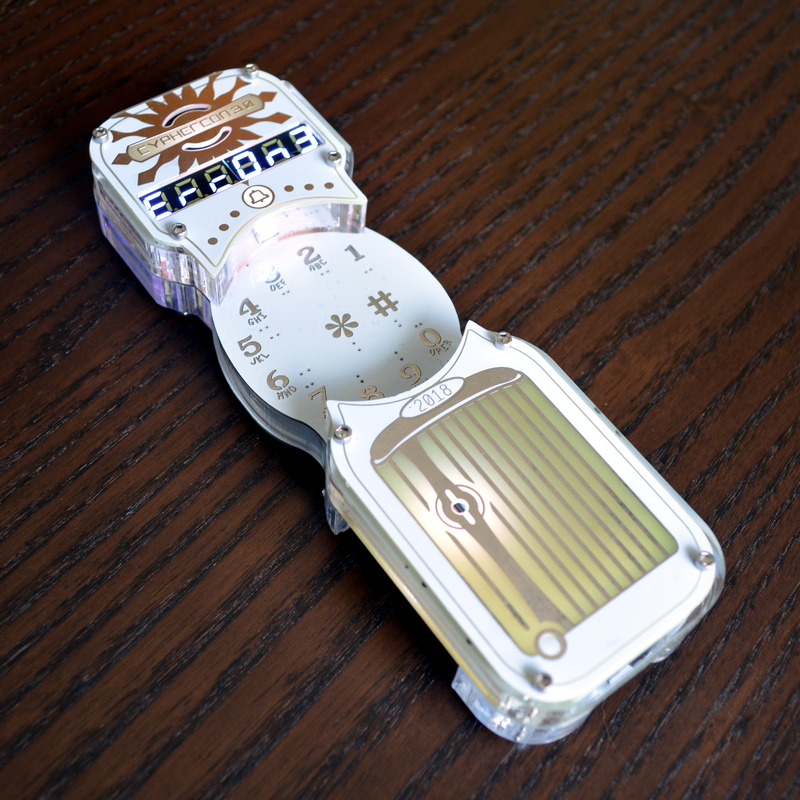 Once the relay computer is complete, the badge turns into an emulator for a vintage time-sharing operating system. In this OS, you’re able to write code and deploy it to other badges. This is seriously impressive stuff. Between the cubic Cyphercon badge, the Hunter S. Rodriguez badge heading to Vegas this summer, and badges that are Nintendo emulators, this is looking like a great year for electronic conference badges. The artistry and skill here is amazing, and we can’t wait to see what else the community will come up with. Below, you can check out a few videos on the Cypbercon badge. [Wire]’s explanation of how the badge was created over the last nine months is in there, as is the Cyphercon badge panel talk.